Like many Coastal Virginia homes, Brother and Meredith Rutter’s waterfront abode is designed with classic architectural details including crown molding, hardwood floors and glistening, panoramic views of the Lynnhaven River through white French doors. Unlike its other Great Neck Point neighbors, Rutter’s home also boasts a collection of newer, more progressive trimmings. 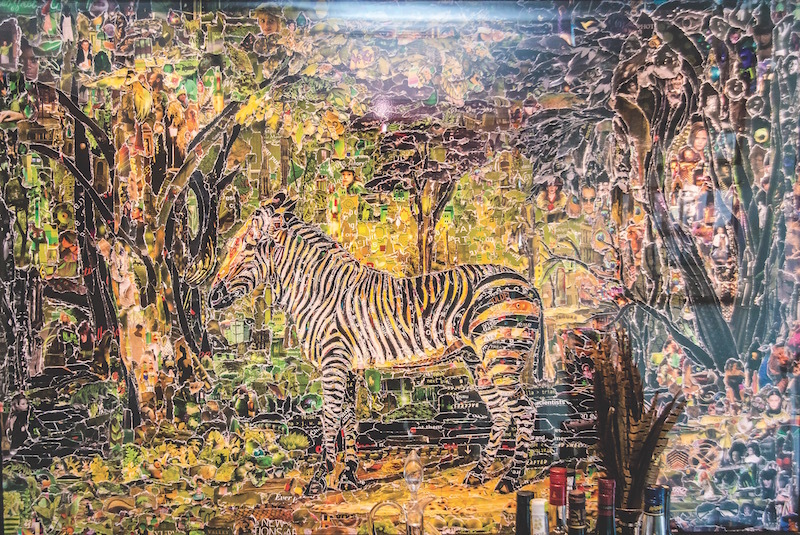 The walls and floors of the home’s foyer, entertaining spaces, hallways and bedrooms are filled with bold and provoking works by some of the world’s most distinguished contemporary artists. Paintings and photographs by Keith Haring, Stefan Brüggemann, Kenneth Nolan and dozens of others are tastefully hung above and between classic antique buffets, sofas and side tables. 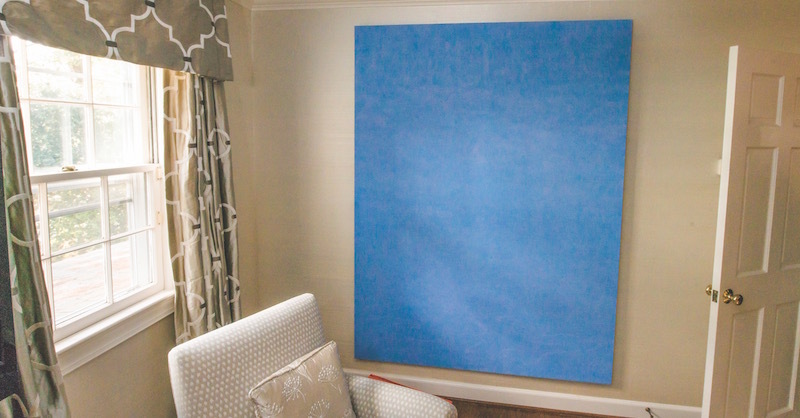 The bright colors and sheer enormity of these works amidst simple, traditional pieces may appear eccentric to the untrained eye, but to an art collector, the juxtaposition of classic and contemporary is a thing of beauty. 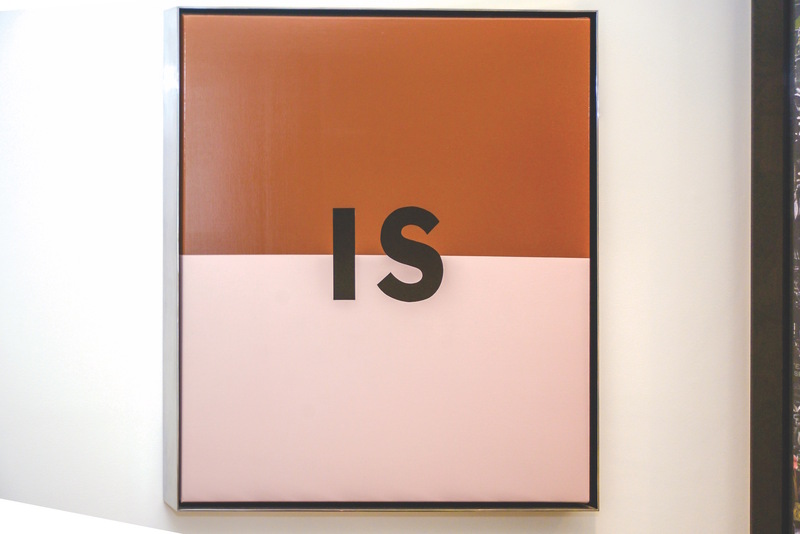 The Hank Willis Thomas painting “Is” depicts equal rights. A symphony of notes all overlayed onto one sheet of music offers a backdrop to their dining room. The delicate balance of traditional and progressive décor is as much of an aesthetic preference as it is a direct reflection of the life and personality of the home’s owner, C. Arthur “Brother” Rutter, III. 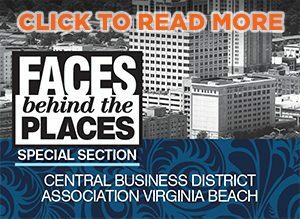 Rutter, a native of Virginia Beach, is one of the managing partners at Rutter Mills Attorneys in Norfolk and is a recipient of numerous prestigious legal awards and recognitions. His workdays often consist of long hours spent in the courtroom vehemently fighting for his clients’ rights, and assuring that each case is tended to with genuine care and compassion. Outside the courtroom, Rutter and his two college-aged sons, Carter and Austin, engage in the beach culture of Coastal Virginia, taking advantage of secret fishing spots, surfing, boating and volunteering with the Chesapeake Bay Foundation and Lynnhaven River NOW. As a former student of Harvard University’s English program, Rutter is also an avid reader and collector of classic literature. Selected poetry by W.B. Yeats and William Carlos Williams and Ernest Hemingway novels are nestled comfortably into the family room bookshelves. 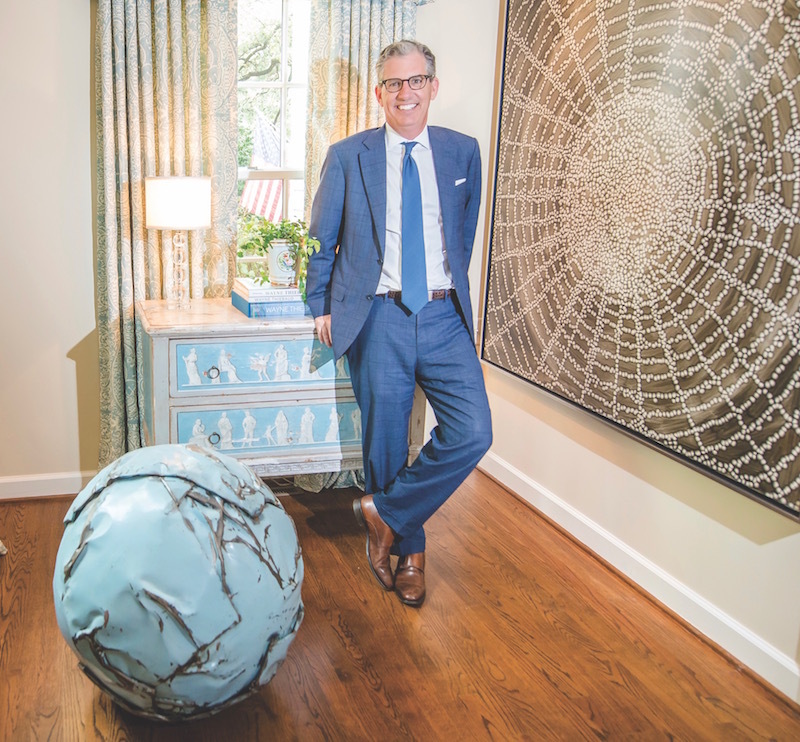 Among these conventional roles as a devoted father, husband and prominent attorney, Rutter also thrives as a member of the rich and complex world of contemporary art as both a fervent collector and active contributor. 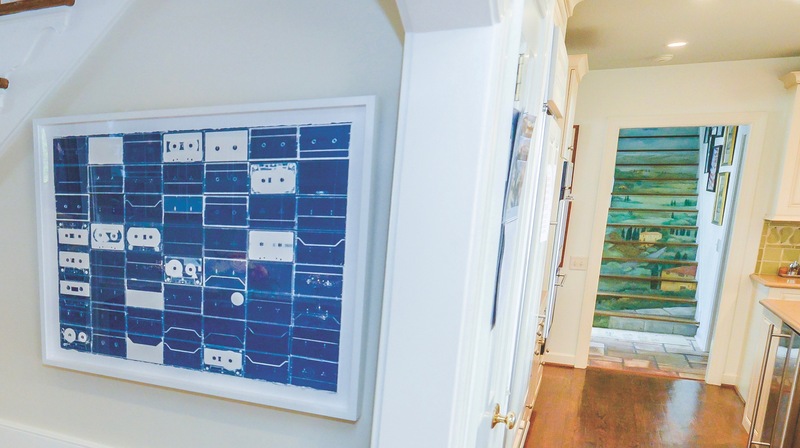 Rutter and his wife own nearly 150 contemporary art pieces collected from auctions and galleries across the globe, several of which include Color Field works from the Washington Color School in Washington, D.C. The couple sits on various contemporary art boards and committees and often loans pieces from their personal collection to museums and galleries across the country. “We have to say goodbye to things for a little while now and again. That’s OK because for me, it generally creates a free wall, which means I can go get something else,” Rutter jokes. 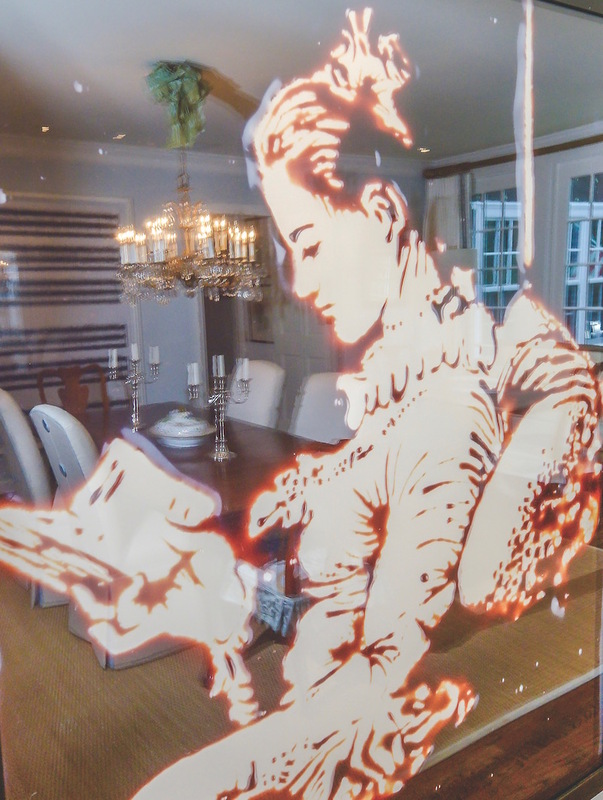 Vik Muniz’s chocolate recreation based on A Young Girl Reading by Jean Honoré Fragonard. Seemingly simple blue canvas reveals upon closer inspection ants and bees working hard within the landscape. Calendar made of scattershot images of the moon. 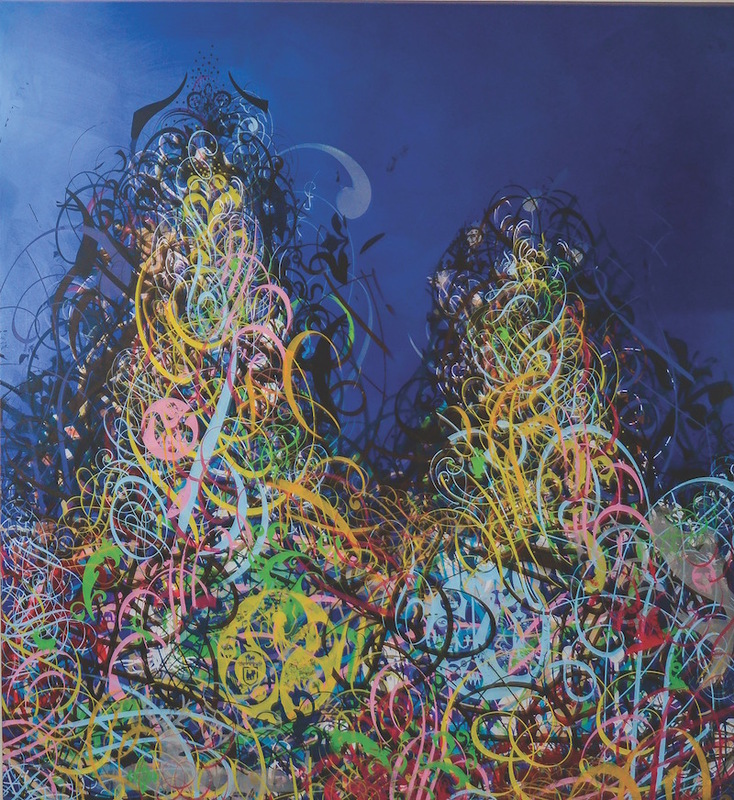 Blue with color swirls painting by Ryan McGinness from Virginia Beach. Rutter’s passion for contemporary art was sparked by a single book given to him by a college roommate called Concerning the Spiritual in Art by German expressionist Wassily Kandinsky. Rutter explains that Kandinsky believed a figurative painter of still lifes and landscape portraits could approximate nature but never achieve it. Only through color and form could an artist create something Kandinsky refers to as an emotion hanging parallel to the wall; an abstract work, much like music, that does not require the application of an outside agenda or understanding but simply the evocation of emotion. 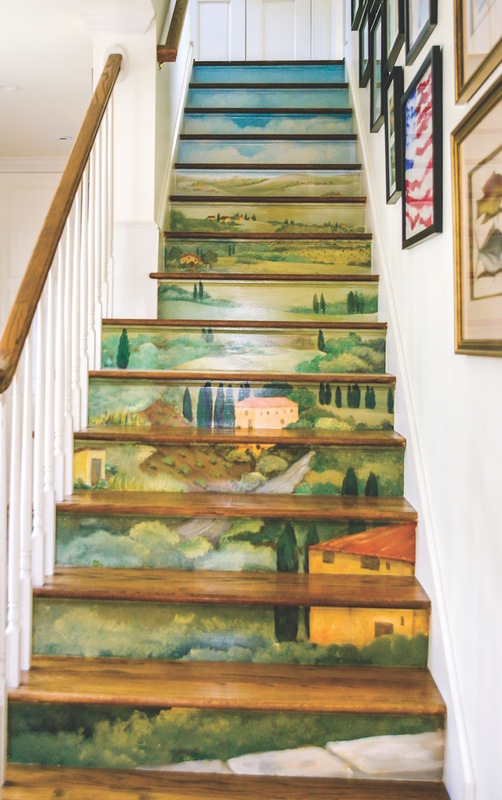 Stairway painted from an anniversary trip to Italy. 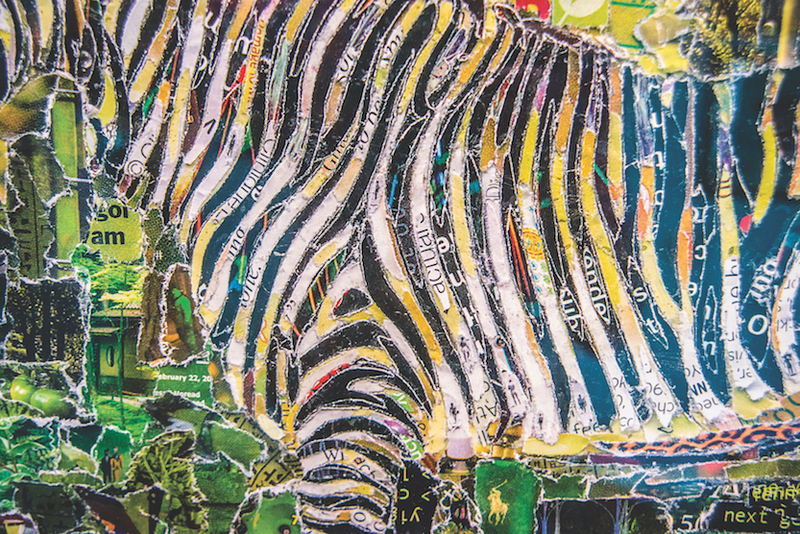 Vik Muniz recreates a George Stubbs painting through collage made from pop magazine clippings. Throughout their marriage, the Rutters have meticulously assembled their 150-piece collection using a very personal and stringent timeline. With the exception of only two pieces, they solely collect contemporary works created during their lifetimes or, as Rutter puts it, 1963 forward. For the Rutters, art functions very much in the same way as a family album. Each painting and portrait adorning the walls of their home recalls a distinct emotion or period of their lives. Rutter reveals that these pieces are just as much mementos of his family’s life as they are wonderful works of art. 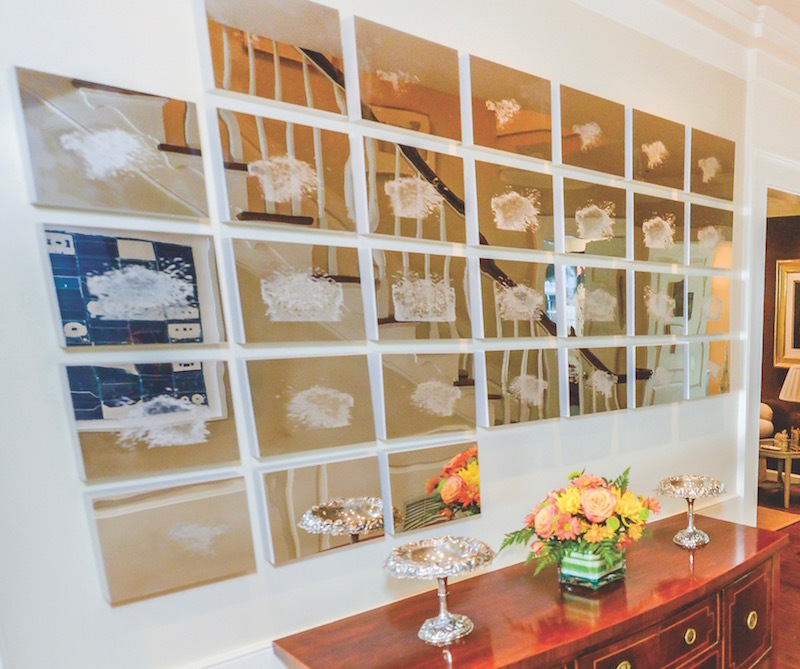 One of the most profound and truly reflective contemporary pieces in Rutter’s home hangs adjacent to the staircase above an antique mahogany sideboard in a 30-piece arrangement. Each of the 30 silver squares are etched with the scattershot photography of individual lunar phases that occurred over a one-month period. The artist, Teresita Fernández, purposefully designed the piece to function simultaneously as a celestial calendar and conventional mirror so that onlookers could see themselves beautifully in the passage of time. Brother Rutter stands next to The Wad, a reclaimed appliance art made from washing machines and dryers. The continuous reflection on the course of time and personal growth mirrored by the Fernández piece drove Rutter and his wife to realize that while traveling the world to visit international artists and witness once-in-a-lifetime contemporary showcases were exhilarating experiences, their constant fleeing to foreign lands inhibited them from actively participating in their home’s local art scene. To become more engaged, the couple purchased the century-old Texaco Building in Norfolk’s NEON Art District in 2013 with the vision of opening an exhibition gallery. Now recognized as the Rutter Family Art Foundation, the renovated Texaco Building serves as a gallery space for local and regional Virginia artists to showcase their talents. 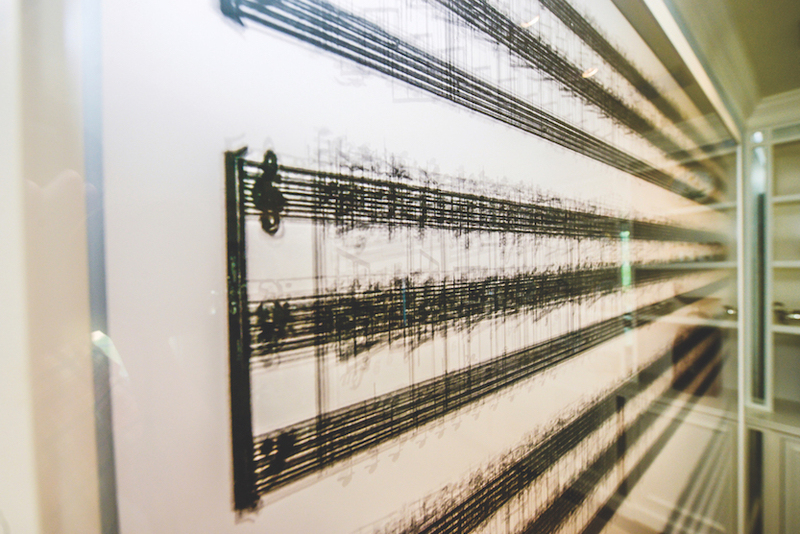 The Foundation hosts several themed exhibitions which include portraits, sculptures, glass works and more by local, regional and international artists. Rutter says that the crosspollination of local and international artists is intentional, providing local artists with the opportunity to share the stage with those who already have significant exposure. The opening of the Foundation was not only the start of a new chapter for Rutter but another period of self-reflection. 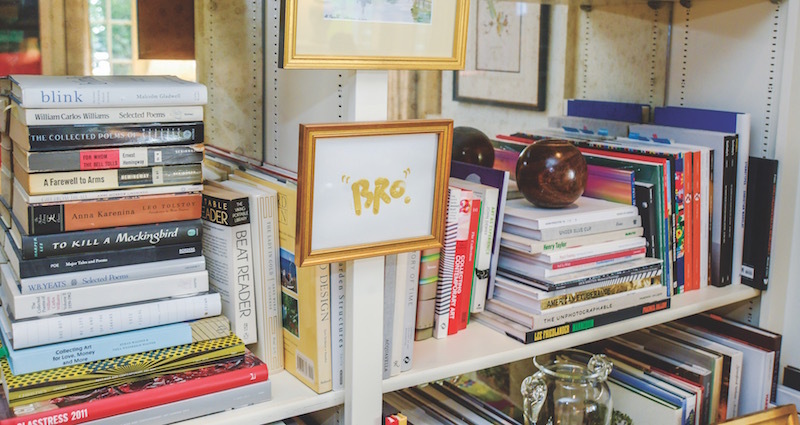 “Throughout my business life, a lot of people looked to me for the next great idea,” he says. “Now, it has been a great process for me to look outward and ask others [in the creative community for] the next great idea. 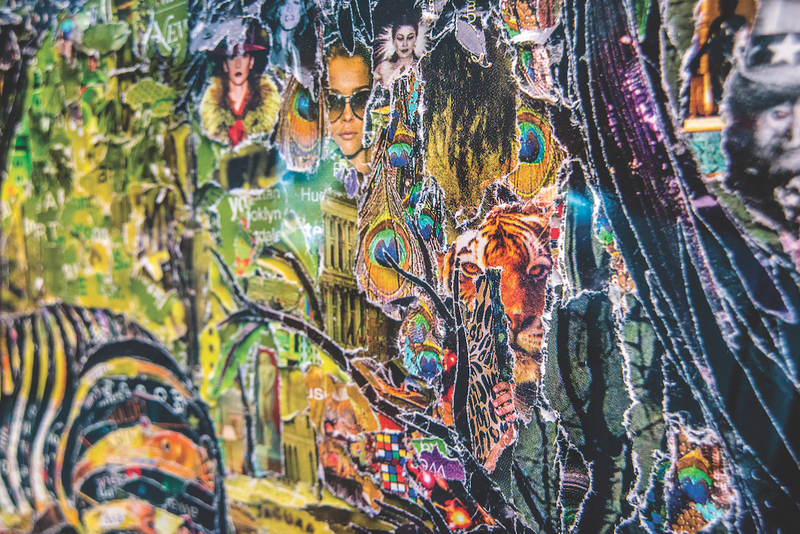 The people that have paint under their fingernails are the ones who know what the creative community needs.” With his Foundation in place, Rutter is proud to leave the future of Norfolk’s art scene in the hands of the city’s young and innovative art pioneers.